﻿October 16, 2014: Town Manager, Libby Gibson, issues letter of concern to Department of Public Utilities regarding winter electric rate hike. Click to Read Letter. July 28, 2014: Lauren Sinatra presents an "Energy Update" at the Nantucket Community Association Annual Forum. Topics included: an energy work-plan for FY2015, Nantucket's "Peak Load Situation," and ways for residents and businesses to save energy, save money, and make a difference! See presentation. July 1, 2014: Town of Nantucket secures 1032 (FREE) LEDs and High Efficiency Fluorescent Tube lights for nearly a dozen Town facilities through the Massachusetts DOER Leading By Example Program: LED Replacement Bulb Project. These new lights (valued at nearly $11,000) will save the Town over 70,500 kwH and $10,500 in energy costs per year! 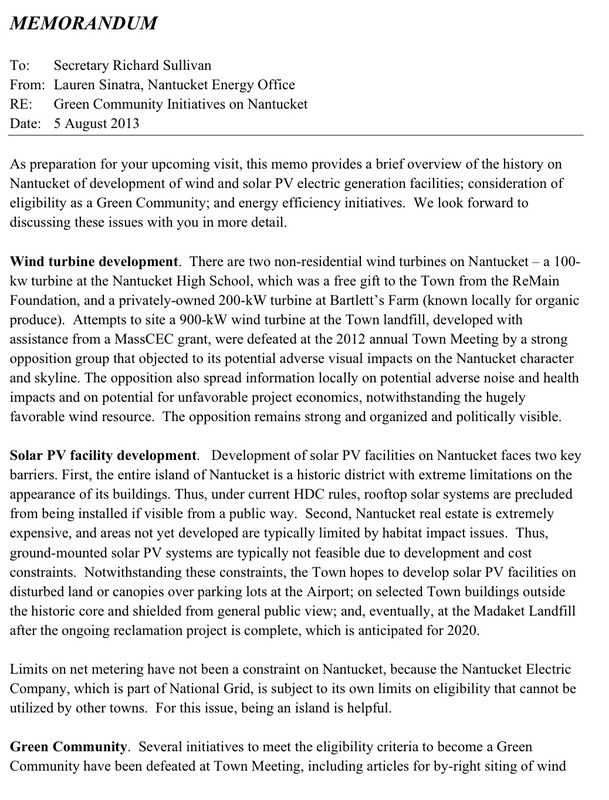 May 21, 2014: Nantucket Energy Office presents update to Board of Selectmen on recent energy activities and projects. View report here! Lauren Sinatra (center) pictured with Mark Sylvia (Commissioner, Department of Energy Resources), Richard Sullivan (Secretary, Massachusetts Energy and Environmental Affairs), Glen Shor (Secretary of Administration and Finance), and Meg Lusardi (Director; Green Communities Division, Department of Energy Resources). BOSTON- On Monday, October 28, 2013, Lauren Sinatra of the Nantucket Energy Office was honored at the 2013 Leading by Example Awards ceremony held at the State House and received a citation from Representative Tim Madden for her contributions to the Town’s energy and sustainability efforts as Energy Project and Outreach Coordinator. In her role at the Energy Office, Lauren has developed important relationships with Town Departments, Nantucket Public Schools, local contractors, homeowner’s associations and local stakeholder groups, as well as with National Grid, the Island’s utility provider, acting as a liaison for the community. Initiating efforts to encourage higher resident and business participation in the Mass Save program by working with National Grid and its vendors, including creating an online submission form for homeowners to request energy assessments. Securing over 600 free LED lamps to replace less efficient light bulbs in Town buildings through the Department of Energy Resources’ “Leading by Example” Program which will save Town Departments over $18,000 per year in energy costs. Playing a key role in preparing a proposal for the Nantucket Memorial Airport that was selected by the Department of Transportation’s Aeronautics Division for a new Carbon Neutral Airport Program. Serving as project advisor for a series of Worcester Polytechnic Institute student research projects that focus on energy-related topics on the Island. Working with the Nantucket Planning Department to install six public electric vehicle charging stations in the Town, made possible through a DOER grant. Representative Madden was very pleased to learn that Lauren was going to be receiving an award, saying, "Having someone like Lauren in this position has been so beneficial to the town in the number of projects that have been implemented to make us more energy efficient and her advocacy on behalf of the residents of the Island on energy issues is greatly appreciated." The Leading by Example Awards recognize outstanding efforts among individuals, Commonwealth agencies, public higher education institutions, and municipalities that have established and implemented policies and programs resulting in significant and demonstrable energy and environmental benefits. The Leading by Example Program, operated by the Department of Energy Resources, was created by Executive Order in 2007 and sets aggressive targets for facilities owned and operated by the Commonwealth of Massachusetts regarding greenhouse gas emission reductions, energy conservation and efficiency, renewable energy, green buildings, and water conservation. 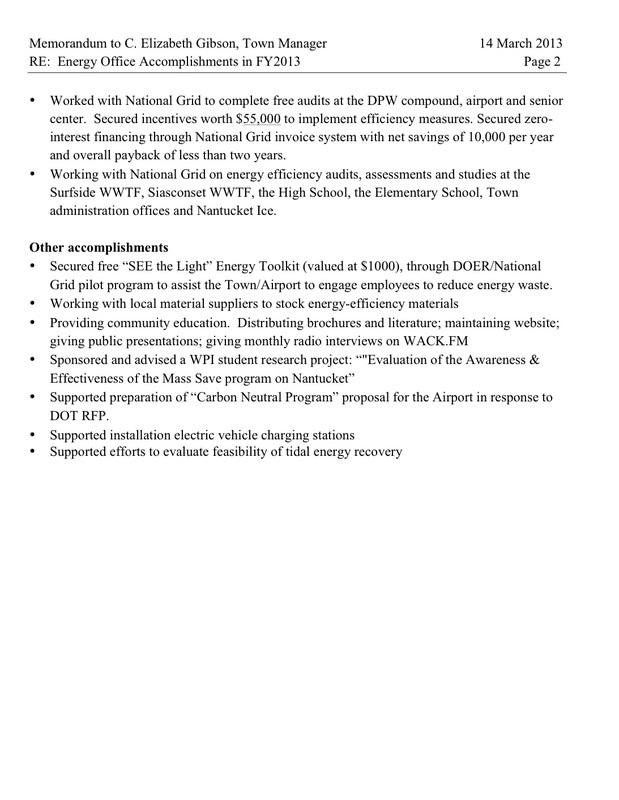 Nantucket Energy Office produces 3rd quarterly update memo for the Board of Selectman. Nantucket Energy Office hosts National Grid presentation on "A Need for a Third Cable? Forecasting Nantucket's Energy Load Growth." Click HERE for more information! Nantucket Memorial Airport Undergoing complete "plug-in" appliance audit--i.e printers, computers, kitchen appliances, vending machines, etc. Identifying energy saving low hanging fruit as part of Carbon Neutral Airport Program! Energy Office co-hosts educational workshop on "Updates to the Energy Code & the Stretch Code" to packed house! Learn more HERE. WPI students arrive to help the Nantucket Energy Office in promoting responsible energy usage on the island of Nantucket by tracking and measuring the energy consumption trends of Town departments. Learn more HERE! 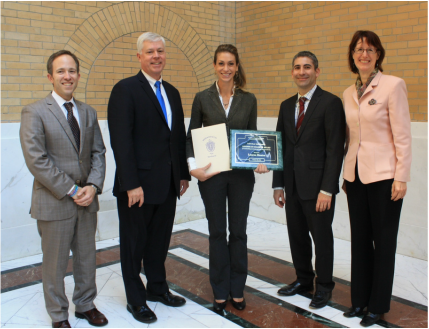 Lauren Sinatra honored at the 2013 Leading by Example Awards ceremony held at the State House and received a citation from Representative Tim Madden for her contributions to the Town’s energy and sustainability efforts as Energy Project and Outreach Coordinator. Lauren Sinatra, Energy Coordinator, to participate in the 2013 Island Energy Conference as a speaker on the “Leadership and Management of Island Energy Projects” panel! Learn more HERE! Free Contractor Info Session on "Making Money with Mass Save!" Lauren Sinatra represents Nantucket Island at the need.org Energy Workshop in Falmouth. October 7-13th: Mass Save Energy Assessment week on Nantucket! Energy Office staff present quarterly report to the Nantucket Board of Selectmen. Read about our accomplishments to date (FY2014). Nantucket Energy Office releases update on "Solar Survey of Solar Site on Town Buildings." Learn more HERE! Lighting efficiency lighting audits conducted at the Fire Station, Surfside Wastewater Treatment Plant, and Sconset Wastewater Treatment Plant. Nantucket High School and Cyrus Piece Middle School to undergo complete efficient lighting upgrade installation! New fixtures are expected to save the schools over $20,000/year and reduce electric bills by nearly 40%! Learn more HERE. Please join us for an informative evening presentation on a very hot button topic! He will then address the issues or concerns he foresees for Nantucket in the near and far terms and layout a variety of solutions for next steps. 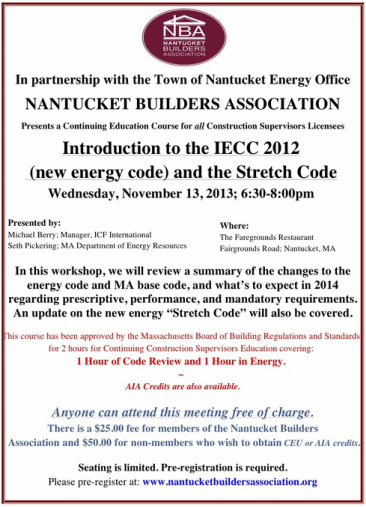 "Introduction to the new Energy Base Code and the Stretch Energy Code"
In this workshop, expert speakers will review a summary of the changes to the energy code and MA base code, and what’s to expect in 2014 regarding prescriptive, performance, and mandatory requirements. An update on the new energy “Stretch Code” will also be covered. On Wednesday October 9, 2013, the Nantucket Builders Association and Town of Nantucket Energy Office will be co-hosting a free, informational event: “Professional Training & Business Opportunities Available under the Mass Save Program.” This presentation will cover energy efficiency incentives available to residential clients, National Grid sponsored training courses, and information on how to become certified as Home Performance Contractors and Independent Insulation Contractors through the Mass Save Home Energy Services program (www.MassSave.com). This event is free and open to the public from 6:30-8:00pm at The Faregrounds Restaurant. MASS SAVE HOME ENERGY ASSESSMENT WEEK! On August 9th, the Town of Nantucket hosted Massachusetts Secretary Rick Sullivan of the Executive Office of Energy and Environmental Affairs for a community forum where he spoke about renewable energy, island energy consumption patterns and peaking concerns, electric vehicles and the Town's proposal to research converting stockpiled waste plastic materials at the local landfill into useful, liquid fuels. 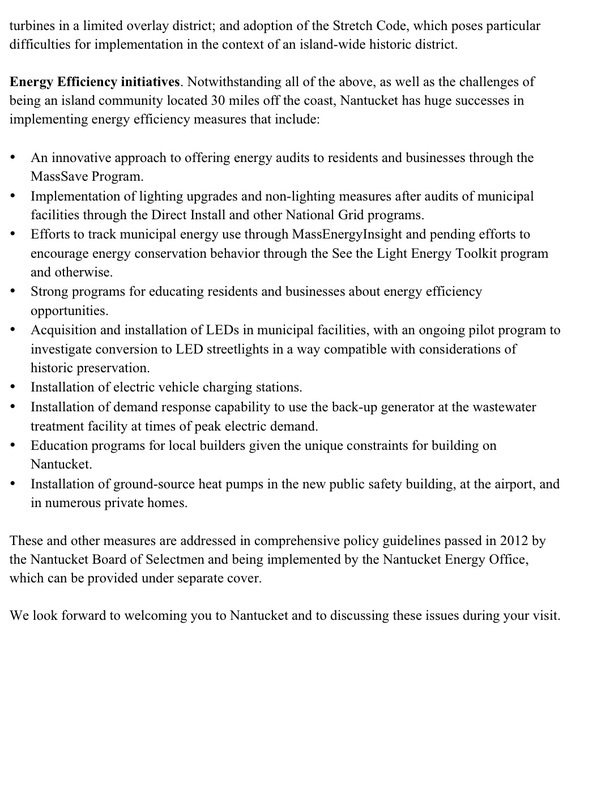 Click HERE to view memo: "GREEN COMMUNITY INITIATIVES ON NANTUCKET," prepared for Secretary Sullivan. The Town of Nantucket Energy Office secured over 650 of free LEDs to replace less-efficient light bulbs in our Town buildings through the DOER's Leading By Example program. The LEDs are valued at nearly $18,000 and are conservatively estimated to save Town Departments over $18,000/year in energy costs. Installation has begun this week at over a dozen Town facilities including: PLUS, Nantucket Memorial Airport, Land Bank, Town Hall, Visitor Services, Finance Dept, Nantucket High School, Public Safety Facility & the DPW Office. Learn more. Memo to Town Administration outlining Energy Office Accomplishments in FY2013, with estimates of the value to the Town.